Better many times over than the usual ways of extending battery life. Batteryvitamin is designed to slow down the rate at which lead-acid motive power batteries wear out - helping motive power battery users get at least 40% extra service life out of their batteries. Batteryvitamin is perfect for forklift truck, deep-cycling solar, battery-locomotive, trolling-boat, electric-car/bus and golf-cart batteries. Benefits include antimony transfer suppression, reduced positive grid corrosion, reduced active material shedding, reduced water consumption, lower end-of-charge current and reduced dendrite formation. Batteryvitamin is able to do this because these benefits all have the same electrochemical origin. Batteryvitamin is a very potent motive power battery life extending technology. Our approach to business has always been "to make the footprints, not to follow in them". We do all our own research and development work. The way in which a lead-acid battery works cannot be discussed in terms of chemistry alone. The interactions that occur at the electrode surfaces are governed by the laws of physics. It is all explained in easy-to-understand language on the technical pages. 100 MPG (City-Driving) Electric Car? How is the Nanobarrier Formed? Why do batteries inevitably wear out? 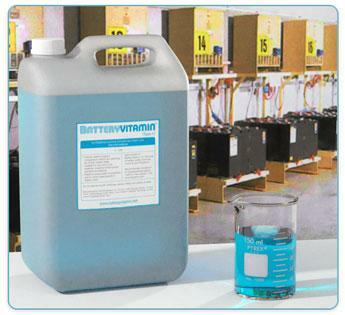 Batteryvitamin typically injected into the battery refill water by water powered dosing unit. Ratio 1:125. Batteries are watered in the normal way. Individual cells always receive optimum dose of Batteryvitamin. Batteryvitamin L provides industrial battery users with the most up to date tool for extending the service life of their hard working batteries. Batteryvitamin L is easy to use and a little goes a long way. It is added as a concentrate to the battery filling water. Every time the batteries are watered the required amount is delivered and distributed together with the water to every cell. Batteryvitamin L can be used to treat new and in-use batteries and is suitable for hand watering as well as single point battery watering. Batteryvitamin L is responsibly formulated to guard carefully against compromising the benefits of purified battery water. Lead-acid batteries require special alloying of the lead grids, as well as additives incorporated into the active materials of the plates, to make them suitable for use in automobiles, forklift trucks, golf-carts, boats, aircraft, etc. This makes them more robust in the short term - but not in the long term. Batteryvitamin is made of materials that are superbly capable of supplying the missing long-term reinforcing needed by lead-acid batteries. BIGGEST BATTERY IN THE WORLD PROMPTED US TO DEVELOP BATTERYVITAMIN. Load-leveling battery - reinforcement of local electricity grid network - rated at 40 MWh - located Chino, near Los Angeles, California. Eight strings, each string 1032 submarine-type lead-acid cells, each cell rated 3250 Ah. Extra long life materials were used, including micro-porous natural rubber separators and special lead-antimony-arsenic positive grid and lead-calcium negative grid alloys - to give a designed cell life expectancy of 4000, guaranteed cycle life expectancy of 2000 deep cycles. The Chino battery provided an important milestone in terms of battery life management. We recognized the unqualified success of this battery. It persuaded the directors of our company to invest serious time and money in R&D, to develop an easy to use technology that can give motive power battery operators hands-on control over the life expectancy of their valuable batteries. It took twelve years. We named it Batteryvitamin. Find out more about this unique advanced battery supplement. Lead-acid motive power batteries, like all batteries, eventually wear out. Deep cycling constitutes the most arduous type of work for batteries. Repeatedly discharging and recharging inevitably causes - (1) the grids of the positive plates to become corroded - (2) shedding of the active material from the positive plates. Shedding begins at about 50% of motive power battery service life, resulting in a progressive reduction in ampere-hours as batteries age. Batteryvitamin has a unique capacity to suppress this corrosion, to cut down shedding, to conserve ampere-hours and, consequently, to extend battery life. 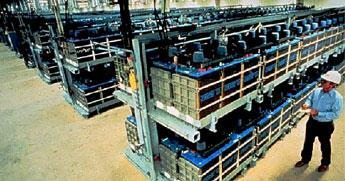 The lead-acid battery industry is well served by 130 years of solid technical experience. The industry's extensive knowhow has been overlaid in the market place by superficially researched concepts aimed at enthusiasts: Sulfation and the merits of desulfation. Widely promoted. Not particularly effective. Sulfation is a symptom, not a cause of battery failure. The makers of batteries and experienced lead-acid motive power battery users are unanimous. It is corrosion of the positive plates, not sulfation, that causes industrial motive power batteries to wear out and eventually become unserviceable. The sulfation that does occur in lead-acid affects, in descending order, recreational marine, light aircraft, military vehicle, automotive and rental batteries - occasionally golf-cart batteries - only very rarely industrial motive power batteries. Batteryvitamin has been designed to help motive power battery operators obtain at least 40% extra service life out of their batteries. We believe that full technical disclosure constitutes the currency of trust. Batteryvitamin has the integrity needed to trail-blaze a switch-over to the most effective battery user cost saving procedure in motive power battery history. IMPORTANT INFORMATION: Details - 158 Walmart Distribution Centers in the United States. Lead-acid motive power battery business breakthrough. ©2019 Batteryvitamin. All rights reserved.